Tag Archives for " Jini Maxin "
Customer trust is a commodity that’s remarkably in short supply. Lack of trust is one of the reasons why businesses fail to persuade customers to buy a product or service though they may have handsome rewards or gift coupons on offer. On the contrary, a good word about your brand or product from a trusted family member or friend might work like magic. It could turn a reluctant customer in favor of your product. Sometimes forever. The fact has been verified by Nielsen study which says, word of mouth marketing is 92% more effective than any other form of marketing. The bottom line is: If you want your business to survive and thrive, get people talking about your product. More than that, get them to refer your product. Even in the app landscape word-of-mouth marketing or referral marketing has proven its mettle, time and time again in driving app downloads. From DropBox, Airbnb, Uber to Evernote, referral marketing has turned out to be one of the most important pillars on which edifice of their success stands. Nevertheless, you don’t have to take my word for it. There are many app companies who are already leveraging customer referral programs as their chief growth engine to drive incredible app downloads and more. With a staggering 3900% growth rate, Dropbox is reckoned to be an all-time referral marketing champ. The company had just 1,00,000 registered users in 2008, which climbed to a staggering 4M registered users within a mere 15 month period, thanks to its straightforward referral program. 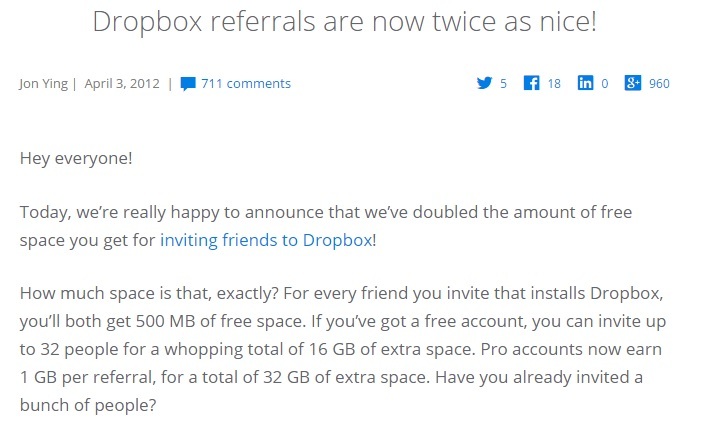 Dropbox offered both the referrer and the referred a free 500 MB space on every successful referral. It’s called reciprocal incentive in the customer referral lexicon. Meaning, customers would refer your brand to their friends and family only if you give them something substantial in return. The referral program resonated well with the users and rest, as they say, is history. Though Dropbox engineered an unheard of growth rate through referrals, but then, Airbnb’s referral program is touted to be the best in the world. Founded in 2007, the company is today valued at over $25 billion, thanks to its double-sided referral program. Airbnb offered both the referrer and the referred $25 travel credit, on the grounds the new member completed his/her first trip. This was a quite a calculated approach by Airbnb as the referrer was paid only when the new user made a purchase. This ensured they weren’t putting money into any unprofitable referral schemes. Plus, they offered an additional $75 credit when the referred hosted a guest the first time. The program was a runaway hit, helping Airbnb double its users each year since 2012. The company is also said to have made the most of the recommended contact feature available in Gmail and Android APIs, which resulting in higher conversions. They A/B tested their referral invites to ensure their referral invites sounded as gifts rather than promotions. The language of the invite was altruistic, given that altruistic emails enjoyed far more success ratio than outright promotional emails. Uber’s referral marketing program had become so popular that today every cab and ride sharing app is duplicating it, be it GRAB TAXI, LYFT, SIDECAR, or GET AROUND. Uber also follows a double-sided referral scheme akin to Dropbox and Airbnb. Nevertheless, the chief attraction is the drivers’ referral program. The drivers are considered to be valued partners of Uber and are offered $5 cash for every new rider they bring on board. Every Uber driver is offered a promotional code which is passed over to the potential So whenever a new buyer sign-ups for a driver’s account using the former’s promotion code they get linked to his account. And when the new driver completes his first ten trips, and if you are the first driver to refer him, you are entitled to $5 cash. Any new rider using your promotional code will get $20 off on their first ride. You gain $5 cash in return every time your promotional code is used by a first-time rider. With a valuation of more than $1 billion, and with more than 100 billion worldwide users, the popular note-taking app has also launched a popular double-sided refer-a-friend program. Both the referrer and referred are rewarded when the later successfully completes a user sign-up. In return, the former wins Evernote Points. The referrer is entitled to use his earned points toward premium subscriptions, increase in monthly upload limit and so on. 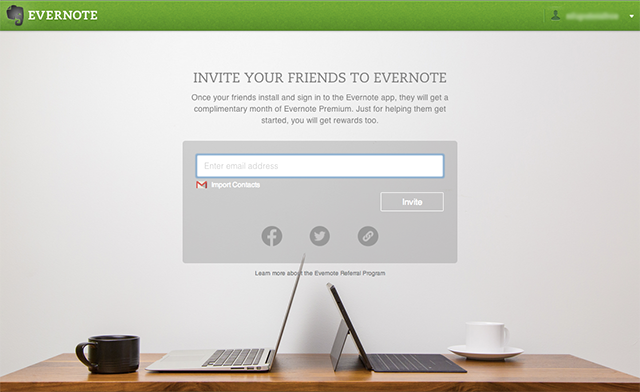 On the other hand, for signing up through your link, your referred – that is your friends and colleagues – would be offered a month of Evernote Premium for free, which means they could enjoy some powerful Evernote features like Offline Notebooks, smarter search, and more. All these four powerful app referral marketing case studies is a testament to the fact that referral marketing is one of the best marketing strategies to boost app downloads. In fact, it could be construed as a shortcut tool to built instant customer trust. Nevertheless, app developers or marketers shouldn’t apply this strategy as soon as the app is ready. One needs to establish a loyal customer base first if they really want their referral campaign to hit the ground running. Don’t target the entire customer base. It could turn out to be an exercise in complete futility. Rather focus on your most active customers, because they wouldn’t mind recommending your app to his or her’s family and friends. All the above-mentioned app referral program worked fine because they leveraged double-sided referral strategy to a T. Like it or not, humans are selfish. (Sure, there are exceptions to this, but by and large, “what’s in for me,” is how the human mind works.) So, dangle the reward bait without any second thoughts, if you really want to your referral program to work. According to a recent study by app analytics firm AppsFlyer, iOS users download apps most during the weekends, while the Android users download more during weekdays. So, while shooting your referral emails via SMS or push notifications, bear this point in mind. iOS apps: Target your referrals on Thursdays and weekends. The iOS apps have 30% higher install rates on these days compared to other days of the week. However, avoid Mondays because there’s 40% drop compared to the weekends. Bottom line: Spend sparingly at the starting of the week when users are less likely to download apps. Android apps: You are free to send out referrals all through the week as app installs are strong and consistent; nevertheless, target Tuesdays without fail, as it witnesses 4% higher download volume compared to the weekly average. Of the several users joining your referral program, only a few would qualify as the key influencers. Find them and reward them handsomely so that they become the brand ambassadors of your app. This goes without saying. It’s the age of social media, so if you want to really want to make your in-app referrals a grand success, leverage different social media channels. Even put your website and mobile site to work. App referral programs are doing good. Dropbox, Evernote, Airbnb, to name a few, are just tip of the iceberg. But then, before you embark on your referral campaign make sure that you earn some goodwill, that is building a good loyal customer base first and foremost. It’s because your referral marketing campaign would literally be riding on their shoulders. And also, make sure you are targeting quality users who would interest in using your app in the long run. And before I forget: A/B test your referral schemes. There’s nothing such as referral marketing blueprint to follow. Tweak and tinker your referral programs as and when needed. So, tell me, are you using referral marketing to attract more customers? How is it going for you? Any experiences worth sharing? We are all ears. 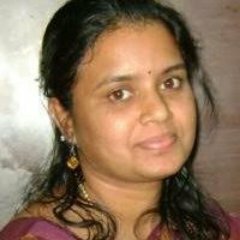 Jini Maxin is a Senior Writer with OpenXcell – Mobile App Development Company which offers mobile app development services across the globe. She is a voracious reader who pours all her learning into producing well-researched and data-driven posts. You can connect with her on Twitter.